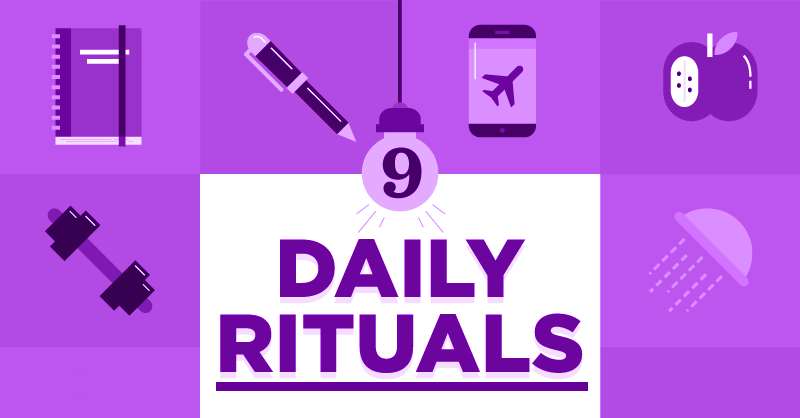 Do you use daily rituals? They can be powerful for getting your day on track from the start! Some of the most successful entrepreneurs will tell you that incorporating a few daily rituals is the best way to get motivated and prepare for the day’s challenges. Why not consider the 9 daily rituals on the infographic as we take on 2018? One or more may help you make it a great year. You can simply Pin the infographic for future reference, or read on for my own daily rituals, and suggestions of relevant books that can help you develop your own. Note: I’m an Amazon affiliate, and will make a small fee if you purchase a book via my link. This costs you nothing, and helps keep my blog going – so thanks! Infographic provided by Pound Place. There’s clear scientific evidence to show that rituals play a crucial role in boosting performance. Scientists say it all comes down to anxiety. It’s not uncommon for entrepreneurs to experience anxiety. Especially we solopreneurs who wear all the hats in our business! Anxiety makes it tough to perform at peak levels. Performing a ritual before you attempt the task reduces anxiety, allowing you to be at your best. ? Since I’m on the West coast, when I get up at 6, most of the U.S. is already starting their workday. My first hour is my best morning time to reach folks on social media. So the first thing I do is check in on my personal Instagram, and post a “flower of the day” photo, which I also share to my personal Facebook. Next, I’ll probably make a cup of coffee and spend some time with a daily devotional. Then I often spend a few minutes stretching before heading to the computer. One weekday ritual I rarely miss is my midday walk. I try to catch some sun as I walk on one of my half-hour routes around the neighborhood. There are many more rituals I follow, but that’s a brief overview of the things that get my day going right. Daily Rituals: How Artists Work An interesting peek at creatives’ daily habits. The classic daily devotional is Jesus Calling by Sarah Young. Check that out if you don’t have it yet. Or her latest 365-day devotional, Jesus Always. Your turn now: Which daily rituals help you get through the day with less stress? Which do you plan to adopt in 2018? Pin the infographic, then let us know in a comment about your daily rituals. Beautiful graphics! I really liked it a lot. #4 – count your breaths was my favorite. I’m learning that as I get super busy, I tend to chest breathe and it’s really shallow. But when I slow down, focus on deep belly breathing, it calms me and I can focus more clearly. Which is good, considering I have 4 children and two jobs! I love this infographic so much! These rituals have helped me improve my life in many areas, not just my online business. I like a quick super cold shower in the morning to fully wake me up. It’s like taking 50 cups of coffee all at once. Cold showers have medical benefits for your body. I’d highly recommend it. I also like stretching and practicing a bit of Yoga. Sometimes I would also go for a quick nature walk, when it’s not 10 degrees outside! I also find that taking daily notes really help you stay productive. Especially, when you are a blogger. Keeping a healthy lifestyle will help you keep a healthy business. I take good care of my diet and what I put into my body. I’ve done my research and it is a fact that your gut (stomach) has a brain of its own. It communicates with your brain, so it is always influencing your thoughts and emotions. What you put into your body can affect how you perform. Just my 2 cents to this awesome blog post! Thank you so much for sharing this! It’s super helpful information! We’re both on the same track 🙂 Though I’m not fond of cold showers in cold weather! But healthy habits are a priority to me as well. Nice post about rituals need to follow. This is very useful and gave me some ideas. Thanks so much for a great resource! I have checked out your site and I found it very interesting and informative.